← Austin, Texas. February 15th, 2011. Bangkok, Thailand. 11th April, 2012. 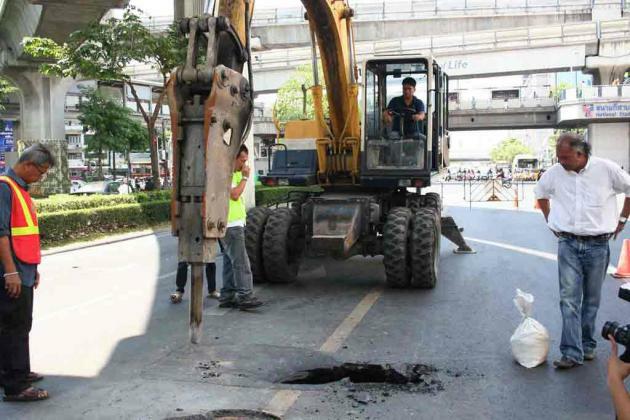 BANGKOK, April 11 – A crater appeared in center city Bangkok’s busy Pathumwan intersection Wednesday morning, with city authorities initially saying the depression was believed to be caused by soil and sand under the road surface moving into a large drainage pipe. Bangkok Deputy Governor Teerachon Manomaiphibul and drainage, sewerage and public works department officials inspected the section of Phayathai Road between the Bangkok Art and Culture Centre and Siam Discovery Centre across the street after a section road caved in earlier today. The hole was initially measured at about one metre deep and one metre wide. However, the busy road was not closed to traffic but city workers cordoned off the area. The department of drainage and sewerage checked the apparent leakage in the drainage system and the public works department will fix it immediately, the deputy governor said. To solve the problem in the long term, Bangkok’s 50 districts have been assigned to list sites on the city’s roads which are often repaired to be examined more thoroughly. The issue will be discussed at a BMA meeting next week, Mr Teerachon said. 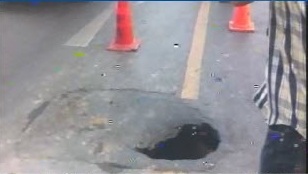 The crater on Phayathai Road on Wednesday was the fourth road subsidence in less than four weeks after last month, a five metre stretch one metre deep crater appeared on a section of Rama IV near the Thai-Belgium Bridge intersection. Earlier this month, a section of footpath along Rama III Road caved in, causing a hole three metres long and five metres deep and a hole 50 centimetres wide hole appeared on Charoen Krung Road in front of Charoenkrung Pracharak Hospital. This entry was posted in Pictures and tagged Bangkok, sinkhole, Thailand. Bookmark the permalink.